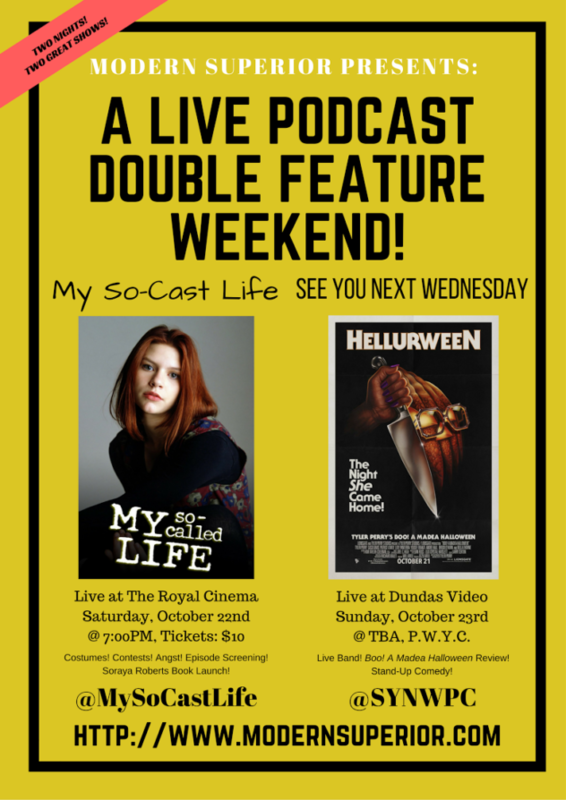 This October, be on the look-out for a double-dose of live podcasting entertainment in Toronto, Ontario! Modern Superior presents My So-Cast LIVE! & See You Next Wednesday. First up, on Saturday, October 22nd My So-Cast Life brings you all the angst you can handle when they record their thoughts on the My So-Called Life season finale before reading from their own teenage-journals and then screen the show! Plus, the event will be co-hosted by Soraya Roberts, who is launching In My Humble Opinion, a terrific book about My So-Called Life itself! The action is hosted by The Royal, so you know it’s going to be good! Then, on Sunday, October 23rd the hosts of See You Next Wednesday will be stopping by Dundas Video to review the brand-new BOO! A Madea Halloween. Before that, they’ll sort through the latest movie and television news while the house-band kicks out the jams. And if you that that was all, you’d be wrong, because opening the show will be hilarious stand-up comedy from Tommy Powers & Rhiannon Archer! All of this, plus so much more. Keep your eyes peeled for a Facebook event, soon! So mark your calendars, circle the dates, x out the days in advance and get ready to count-down, Bart-style, to Modern Superior’s double-feature of podcast excitement this October!